If you’ve looked around this website at all, you already know that I think the Myers-Briggs personality type theory is da bomb diggity. Maybe it won’t solve all of your problems, but it will help solve many. Sick of your job? Check. Not getting along with so-and-so? Check. The Myers-Briggs Type Indicator (MBTI for short) was originally developed to help people choose careers that match their personality and that is still one of its main uses. We are all gifted in different areas and this typology helps you pinpoint where your natural talents lie. But the practical applications of this theory go way beyond your work into general life happiness and relationships. According to the Myers-Briggs Personality Type theory, there are 16 personality types, each with a four-letter combo. So what is the best way to figure out your personality type? One option is to to take a test. There are plenty of free online personality tests that you can find by googling. They can be fun to take – it’s kind of like doing those tests in women’s magazines. But the problem is that the tests are sometimes not accurate. They can mistype you and lead you down the wrong path. Or they may not be able to type you at all. When my husband took one of the tests, the results were inconclusive on three out of the four traits. The best way to find your personality type, in my humble opinion, is to learn what the letters mean and then decide for yourself which ones apply to you more. 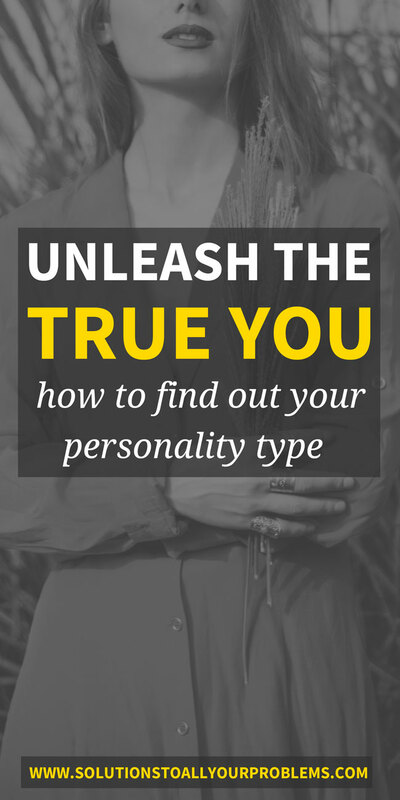 So in this article I will teach you how to find out your personality type all by your awesome self without any test. Introversion and extraversion are orientations to life. What energizes you and where do you like to turn your attention? Some people prefer to turn inward and pay a lot of attention to their inner world of thoughts and ideas. These introverts are more reserved and need time alone to recharge their batteries. 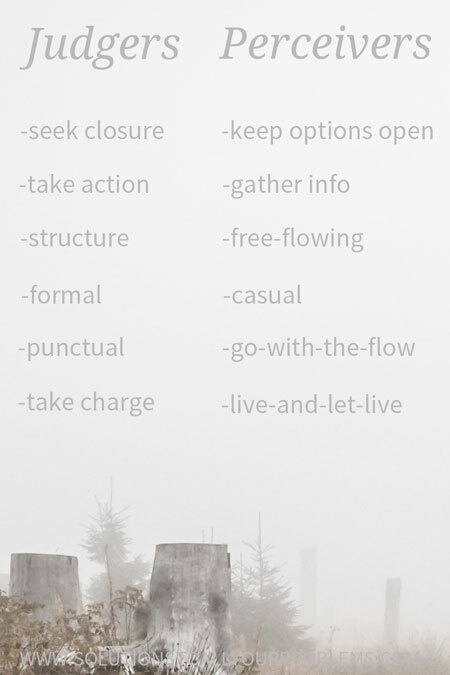 Introverts usually pause and consider before speaking or taking action. Introversion is often confused with shyness, but not all introverts are shy. 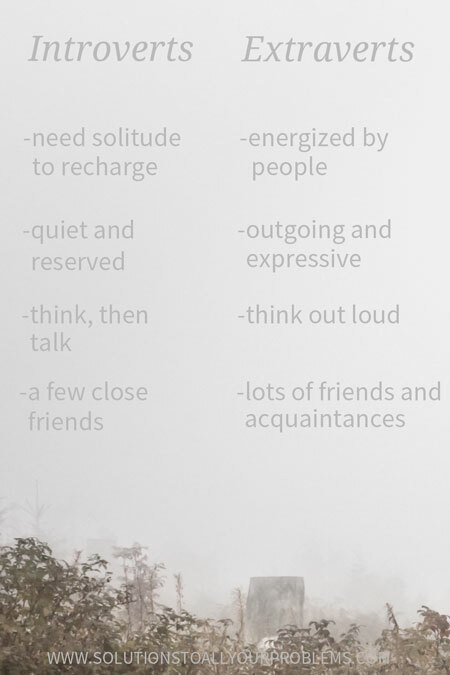 Introverts simply enjoy and have a need to spend some quiet time by themselves. When it comes to relationships, most introverts would take a few close friendships over a large number of acquaintances. Other people prefer to turn outward to the external world of people and things. These extraverts are more outgoing and expressive. They feel energized by being social and active. Many extraverts like to think out loud – talk first, think later – and they like to have a lot of people in their lives to talk to. We all do both – we all turn inward and outward – but we have a preference for one side or the other. Some sources estimate that half of us prefer extraversion and half introversion. Which do you think you prefer? I’m an introvert and I can happily spend an entire day alone reading and writing. I will feel awesome at the end of the day. Drop me off at a party full of people to meet and socialize with though and you will pick me up a few hours later exhausted, complaining of a tension headache and wanting to go straight to bed. Are You An Intuitive Or A Sensor? We all need a way to perceive the world. We need a way to take in information, process it, and figure out what’s going on around us. But we have different preferences for what kind of information we naturally pay attention to and trust. Some people prefer to perceive by sensing. Other people prefer to perceive via intuition. Sensing simply means using your five senses to detect what’s in front of you. Sensing relates to concrete things. What do you see, hear, smell, feel, taste? What is actually happening right now? People with a sensing preference tend to be more observant of facts and details in their immediate environment – they notice things. Some would describe them as more down-to-earth and practical as well. 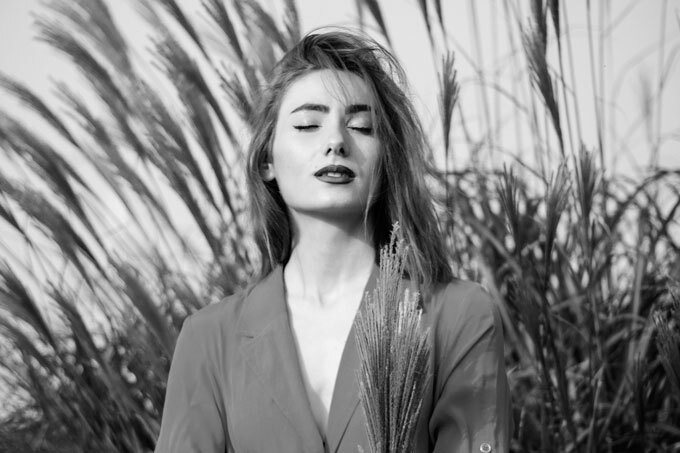 An intuitive mind, on the other hand, will unconsciously take in lots of cues from the environment, put it all together, and produce new insights or ideas. 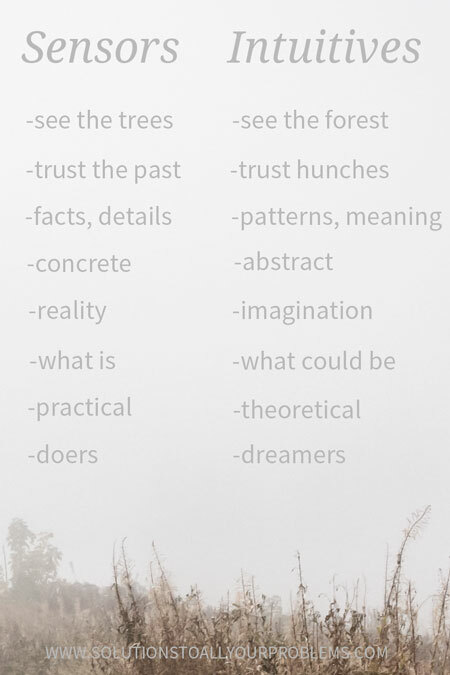 Unlike sensing, which deals with concrete matters, intuition deals with the abstract – with theories, with ideas, with possibilities, with meanings, with implications. What could potentially happen? How could things be changed? Intuitives tend to be more future-oriented and imaginative. Intuitives often have their “head in the clouds” thinking about the big picture and might miss concrete details around them. Again, we all use both kinds of perceiving, but we prefer one or the other. It’s estimated that at least two thirds of the population have a sensing preference, with intuitives in the minority. Would you say you are more comfortable in the practical, tangible world or in the world of abstract ideas? 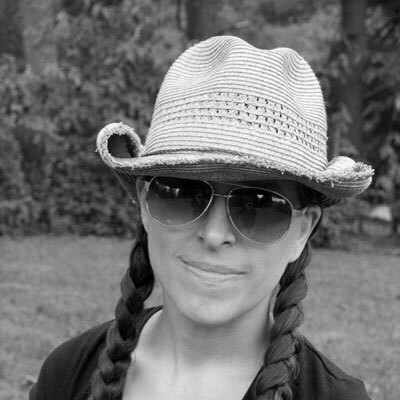 I’m an intuitive and my husband is a sensor. I’m the absent-minded dreamer – he is the practical doer. I’m always thinking about the future and how to change things for the better – he is the one that makes sure we get through today. I’ll be thinking about our five-year-plan – he’ll be thinking about picking up groceries today. I trust my hunches because I know – he looks for concrete evidence. I’ll notice the neighbor’s house is a different color – he’ll tell me they painted it two years ago. We all need a way to make judgments. After we have figured out what’s going on (perception), we need a way to make decisions about how to respond or what to do in a given situation. Some people prefer to make thinking judgments that are logical and objective. Other people prefer to make feeling judgments that are more subjective. Thinkers consider logic and consistency first and foremost and tend to do better working with impersonal facts, ideas, and things. They like to objectively weigh pros and cons. They are good at being analytical and value truthfulness over tactfulness. Feelers consider impact on people first and foremost and tend to do better with handling people and relationships. They like to give more weight to their personal values about an issue. They are naturally sensitive to other people’s feelings and would rather fudge the truth than hurt someone’s feelings. It’s not uncommon to stereotype all men as thinkers and all women as feelers. This isn’t entirely misguided as a majority of men are in fact thinkers and a majority of women are in fact feelers. However, there are plenty of women and men of both types out there. Our society has just put a lot of pressure on thinking women to act more warm and fuzzy and feeling men to be more objective and calculating. Would you say you are more of a warm and fuzzy feeler interested in people? Do you like to talk about feelings? Or would you say you are a logical and objective thinker interested in facts and things? Does talking about feelings make you uncomfortable? My mother is a thinker and my grandmother is a feeler. If I want love and comfort, say, after having my heart broken, I will go to my grandmother. She will give me a hug, make me a cup of tea, and let me cry. If I need help in an emergency, say, after giving birth to twins when I already had a toddler (yes, that is an emergency! ), I will go to my mother. She will keep calm no matter what happens and do what needs to be done. In the two previous sections, we talked about ways of perceiving (sensing and intuition) and ways of judging (thinking and feeling). But people also have a preference for perceiving overall versus judging overall. Some people prefer perceiving – ie. gathering information – over making a judgment about that information. People with this perceiving preference like to wait and see and keep options open. They want to keep perceiving and taking in information for as long as possible. These people tend to be more “go-with-the-flow” and “live-and-let-live”. They are often casual and more fun-loving. Some can be messy and disorganized. Perceivers are also known for having a very flexible attitude toward time. If taken too far, this preference results in procrastination to the point where nothing ever gets done. Some people prefer making judgments – ie. taking action – over perceiving (gathering more information). People with this judging preference like to make quicker decisions. They want to settle things so they can take action. They are also more likely to take charge and try to control others in their quest to have things settled and done. They like sticking to schedules and being punctual. They may be into formal rules and structures as well. An inflexible control freak would be someone who has taken this preference a bit too far. The descriptions above apply to extraverts particularly well. If you are an extravert, it’s probably fairly easy for you to pick a group. The only confusion might arise from the fact that our society and most work-places reward judging behavior, so you might have taken on some judger characteristics even though your natural preference is for perceiving. IPs can be quite organized and even regimented with their personal and with their inner lives, but they don’t typically try to control or manage others or be very comfortable with others controlling them. When they are in an extraverted mode – relating to the outer world – they behave more like perceivers. IJs can seem very opinionated and “take-charge” and structured when they are in an extraverted mode. But in their inner world, they love being in the perceiving or information-gathering mode. Do you think you lean more toward a perceiving preference or judging preference? One of my kids is a perceiver, while two are judgers. The judgers love to have and make choices. Do you want an apple or a banana? Do you want to go to the store with Dad or stay home with Mom? Do you want to read this book or that? The judgers have no trouble making these kinds of decisions and they like the feeling of control. The perceiving child, however, will frequently end up in tears if asked to make a choice. She wants both. What if she makes the wrong decision? I want an apple… No, no, I want a banana! If you are having trouble deciding between some of the pairs, it might help to remember that what we are talking about here is PREFERENCES. At least to some extent, we can all act like or take on any of these personality traits when we need to or want to. But which side are you more comfortable with? Which side do you lean toward more? Which side are you naturally better at? As an INFJ, I can make myself act extraverted, but that’s not my natural way of acting and tires me out pretty quickly. I can use my senses, but I’m much better at using intuition. Sometimes I make decisions purely based on logic, but I’m much more interested in people than in things and it makes me uncomfortable to ignore feelings. Another thing I can tell you is that sometimes it takes a while to find the type that is closest to describing you. We are all more than our type. 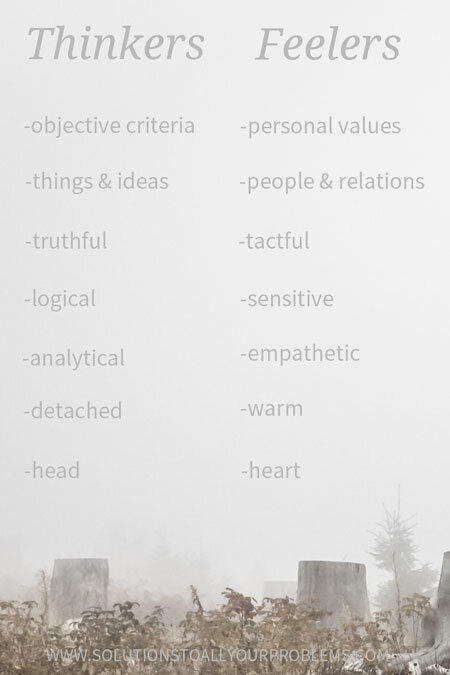 The typology is just a way of putting people into rough categories, but none of us fit the descriptions exactly. Our natural preferences are one part of our personality, but there are other factors at play too, like our upbringing and culture. There may have been a lot of pressure along the way to act “against your nature,” which may now make it confusing to figure out who you actually are in your core. So now that you know your combo or you are close to figuring it out, what are you supposed to do with it? …make it easier to find people who are similar to us and learn how they have been able to make things work. …help us clarify what we like and design lifestyles that suit our personalities. …give us words to talk about how we are the same and how we are different from each other. …figure out why our personalities clash and figure out what to do about it. Whether you are struggling with work or relationships or life in general, being aware of personality type can make a HUGE difference.